Santa Cristina is a perfect choise for your ski holidays - the lively village attracts thousands of skiing enthusiasts and it is worth your time to visit the ski resort and get to know the sunny side of life with breathtaking views. 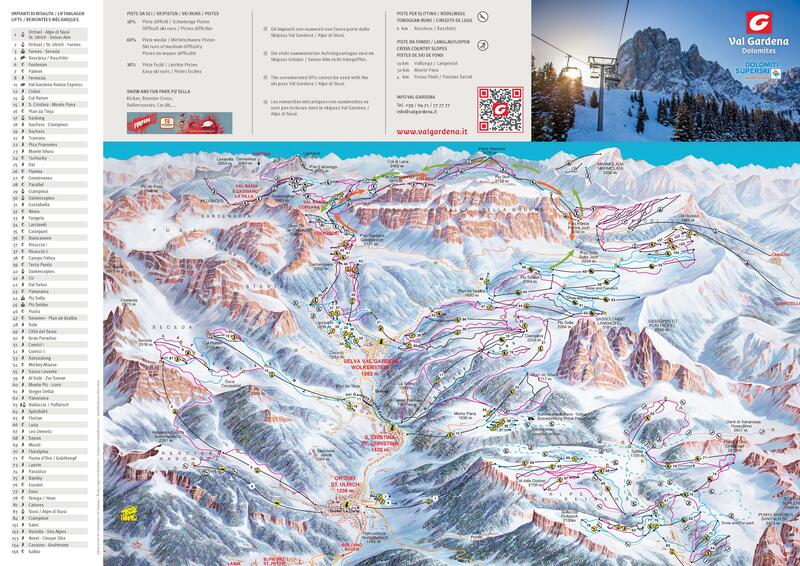 Santa Cristina is the smallest of Val Gardena three villages. The ideal location of the resort makes it possible to ski the famous Sella Ronda as well as the slopes of the Dolomiti Superski starting from the village center. Definitely the most well-known run above Santa Cristina is Saslong - the location of World Cup ski racing and it is visible from the main Saslong gondola from the village. There are no direct trains to Santa Cristina. Nearest train stations are Ponte Gardena and Bolzano. We use a dynamic pricing system to ensure that our clients always pay the lowest price for transfers to Santa Cristina. For a precise price we will need to know specifics of your group and your travel plans. However, we at Alps2Alps will do everything to provide you with the fastest, and most reliable Santa Cristina transfer for the lowest cost on the market. All of this above will result in our base-rate for ski transfers going down - we never over-inflate our prices at any time and for any reason. We also offer great discounts for off-peak, low -season and midweek transfers to Santa Cristina. If you are looking for best price possible offers, travelling outside peak season and midweek typically results in the biggest savings. We offer midweek (Monday to Friday) prices with up to 60% discount than weekend prices. Santa Cristina offers courses for everybody - even expert level skiers can try World Cup run at Saslong. Local ski and snowboard school will be there to help you improve your skills. Santa Cristina is a quite village with traditional South Tyrolean atmosphere - it is the home to charming architecture, mix of restaurants and shops that offer a true taste of local culture. Booking resort transfers is more than just getting to your destination - we see it as ensuring you the perfect start of your winter holidays and we at Alps2Alps offer a great package of quality, reliability and price. We advice booking as early as possible to take advantage of maximum availability and the lowest possible prices. If you have any questions or you can’t find the resort or service you require on our website, get in touch with the Alps2Alps customer service team today. Great trips to Santa Cristina start with the best transfers - let the experts at Alps2Alps show you the way!